The little stump of candle left by the memory of his predecessors casts no light on the way ahead, only on what lies behind. The artist is so made that he can’t go back without giving himself up for dead. He must go forward in whatever direction his efforts may carry him—for every generation the ground behind you is a quicksand. Though my body resides in the Dallas/Fort Worth metroplex this weekend, my spirit has soared ahead to Spring Break and my return to Corpus Christi for my one-man show, “A Week on the Laguna Madre,”showing March 3-26. The artist’s reception will be held Wednesday evening March 16, from 5 till 7:00. 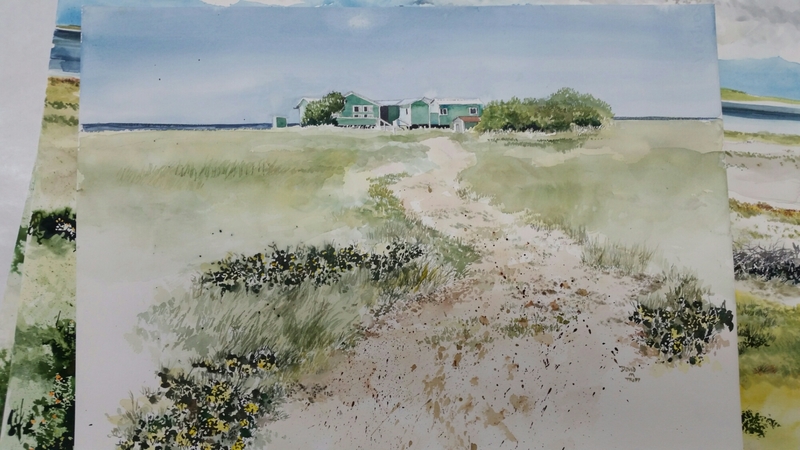 I have been invited to conduct two plein air watercolor workshops while there that week. The first will be for two and one-half days, March 15-17 at the Art Center. Tuition for this one is $250. Details for this show are on the following link. You won’t find Poussin in Cézanne. You won’t find Cézanne in Matisse. You won’t find Matisse in Motherwell. And you won’t find Motherwell in me. But the passion, the ideas are still there, undulating beneath the placid surface waves of my consciousness. When I make art, I enter a different world. And it is the act of drawing and painting—the dance—that moves me more than the image that emerges from the white picture plane. And the dialectical struggles inherent in composition also energize me. One stroke calls out for a second. A warm color coos for a cooler one. A dark tone whispers for a lighter one to conjoin. I hear this conversation among the elements as I arrange them like a little boy arranging his miniature soldiers on the field of combat. And I feel that in this action I am partaking in something cosmic and historical—I am part of this web of current existence as well as an extension from the past. And my directional light comes from the past, from behind. It is never found out front. I am the artist. Like Andrew Wyeth I now focus on the close-up leaves and plan to study Albrecht Dürer. Remember [my high school art teacher] Mr. Scucchi’s crow quill pen and ink wash of the corn stalk. Amazing! I will study these. Now, I am more artist than teacher or philosopher or musician. My imagination is flooded with images of the beautiful world which I have always loved, always scrutinized. But now, somewhere between Thoreau and Wyeth, I let nature seep through my pores. Somewhere, between Wyeth and Thoreau, I pause. Like Wordsworth I pause. My Grandma Tripp’s yard with all its odd fencing, vegetation and brooder house, comes back to me in waves. Ghosts. Voices. Whispers. I pause. Epiphany is there. The drawing and watercolor emerge from the white void, the white cloud of the paper plane. Surely there is Oriental thought here as well. Explore. Gaze. Contemplate. Ruminate. Let the images emerge. 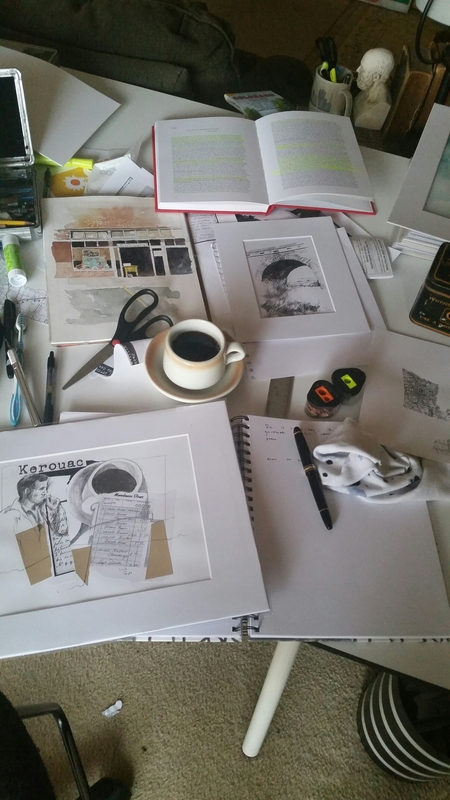 In the words of William Carlos Williams, “Let it come to you!” Myriads of images. And when the dust settles, package them and store them for future display or studio use. Thanks for reading my wandering thoughts . . . It’s been a most pleasant Saturday morning over coffee. Laying aside the odious task of grading and compiling figures over the past several days, the acts of drawing, watercoloring, reading, thinking, conversing with dear friends and journaling my thoughts have emerged with more sweetness than ever before, it seems. Back in 2009, I embarked on a long road trip that took me down many memorable paths, one of them being Highway 79 in Missouri. I passed through Winfield just as the sun came up, and paused to photograph this magnificent facade of a building bathed in that warm summer light. Now, in 2016, I am drawn back to this subject, because a former resident has found me online and shared some fascinating stories of its history and her own experiences growing up in it. I am posting the Thornton Wilder quote, because I feel that that is the common sentiment of people assessing the significance of their own small towns, as well as the sentiment of the outsiders looking in. Personally, I have no interest in fame embracing any Winfield residents; I am just enriched when I hear the stories that are so real and worth recalling. The stories echo the sweetness of what I knew in my own small towns throughout the years of my youth. As this picture develops, and others of the same subject along with it, I plan to pass on some of the stories handed to me about this quaint Mississippi River town that reminds me so much of the small towns I knew in southeast Missouri when I visited relatives during the years of my growing up. I hope to see you at one or both of these! 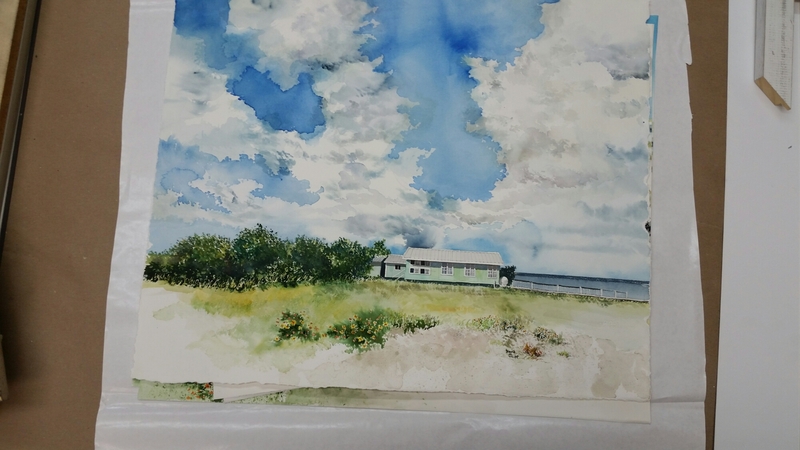 Grading deadlines have assaulted me the past several days, but I’ve been nibbling at an 8 x 10″ watercolor of a subject I’ve already painted three times before and am now pleasantly reminded of it, thanks to some phone calls from one who grew up in this small town of Winfield, Missouri, north of St. Louis along Highway 79. I’m itching to finish it, but more deadlines are dogging me today. So, why do you think that is ever going to change? Today has been a day for cleaning up many unfinished art projects and sorting out new ideas for the studio. 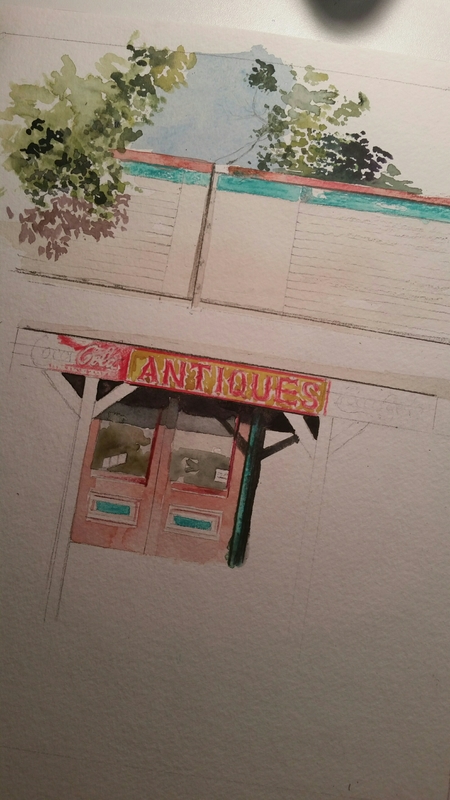 I have begun a new watercolor of an old subject I did years ago (twice) and am excited about its prospects. 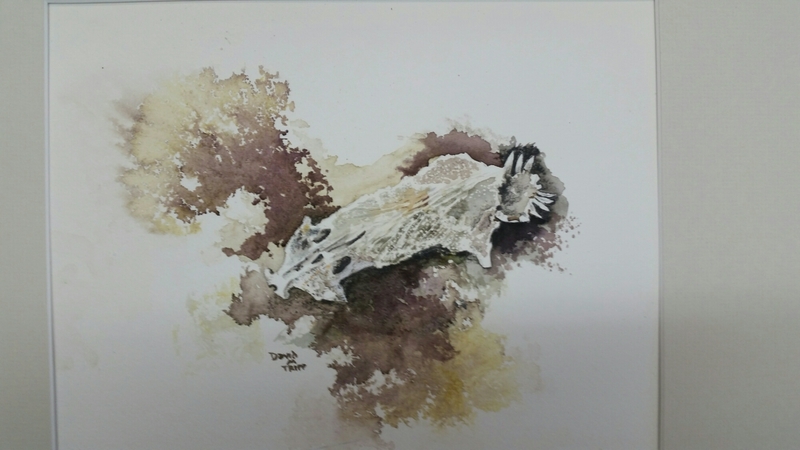 I am unable to post it because it is so pale with preliminary washes that no reader would be able to discern the subject yet. Soon, I hope! My dear poet friend Stacy published on her blog this morning and knocked the wind out of me. I am posting the link below. That is exactly the point. My thoughts are always better than my expressions, whether they be public discourse, playing guitar, singing, writing, making art, even journaling. My expression never reaches the quality of my idea. My works of art never reach the level of Art. I suppose the sooner we accept that reality, the easier it will be to pick up the pen or brush or musical instrument. He continues to inspire people to make art out of the substance of their daily lives, rather than to seek out special ‘artistic’ subjects. He continues to inspire ordinary people to break out of the narrow confinements of lives they have beeen handed down. It seems unfair to awaken at 5:30 on a Saturday morning, but at least I used the time to finish reading the Jack Kerouac biography I just cited above, spend some time scribbling in my journal, then making a stab at sketching one of my favorite spots for flyfishing–the Brazos River below Possum Kingdom dam, where they release rainbow trout every winter. 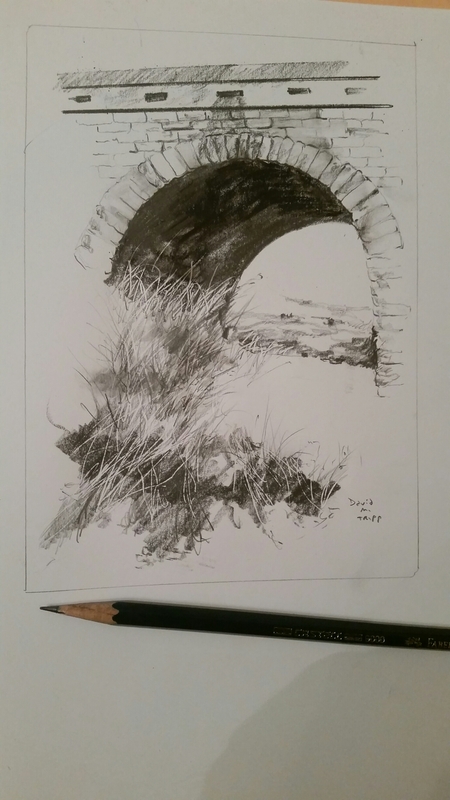 I took a photograph of my favorite Highway 16 bridge the last time I went there, and since I got totally skunked, catching zero trout, I thought I may as well attempt some sketches of that gorgeous environment. Sketching brightens my disposition, and I needed that this morning. Reading details of the closing decade of Kerouac’s life always saddens me. He didn’t manage to publish On the Road until 1957 and then eleven years later he was dead. That final decade was tragic beyond words, as recognition for his literary work finally came while his spirits tanked. He lacked the disposition to savor being a public figure, and writing no longer brought him bliss. I like the observation that Turner drew near the close of the biography, and I love the challenge of creativity just as much as I love people who respond to that challenge. Recently, I have felt pain as I have read one account after another of a famous creative spirit who could not continue to thrive creatively when the fame set in. Often it was because they were stripped of their environment of solitude that was necessary for creative exploits. Added to that was the pressure to sustain a particular style or signature that fed the public but no longer intrested the creator. That often proved a no-win situation. If they continued in the style, they were unhappy, feeling that they were doing hack work to satisfy the market. If they did indeed pursue new stylistic avenues, the public rejected it, wanting the familiar trademark stuff. I have always savored the remark made by Robert Motherwell in an interview concerning the life choices of the Abstract Expressionist artists before their work was discovered: “If no one gave a damn about what we did, why not do whatever we wanted?” That is the kind of felicitious artful lifestyle that appeals to me–being able to do what pleases oneself without having to worry about the market. I have not expressed enough gratitude for my having a steady job throughout my adult life that supports what I do in the creative realm. I can succeed or I can fail at my art, but at least I can continue to earn a living and not have to ask anyone to support what I do. Since January 2000 I have proudly served on the adjunct faculty of Texas Wesleyan University, teaching evenings, weekends and now online. My adjunct work reaches back to 1985, all of it rewarding, but none coming close to what I have savored on this hill in Polytechnic Heights. 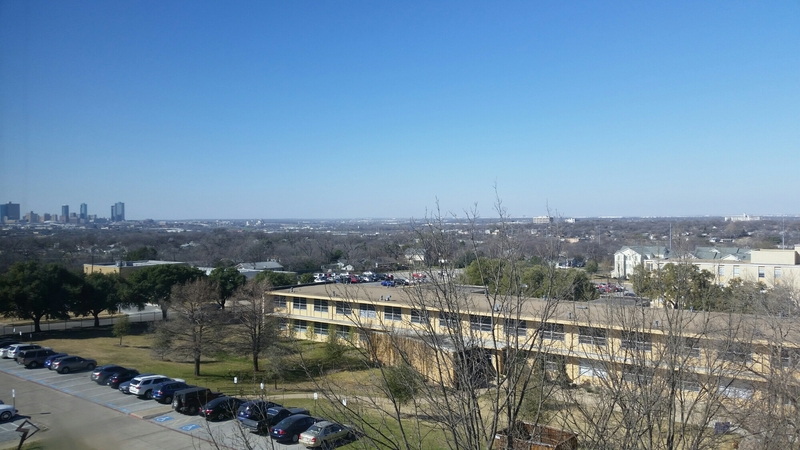 Before and after evening lectures, I climbed the stairs to the library’s top floor, for no other reason but to cloister in one of the carrels, behind a closed door, and gaze out across the land to the city of Fort Worth on the horizon. In this quiet room, many volumes were explored, journals were filled and dreams were allowed to soar. Today I bussed my AVID students to a college fair in Fort Worth, and now I have two late-afternoon appointments at the university. Arriving early, I couldn’t resist the urge to climb the stairs and seek a private space in which to dream again. This one I am particularly looking forward to seeing in a frame. It is one of my last ones to do of the Laguna Madre, & I feel somewhat sad to think that this chapter is almost complete. I also forgot about this hardhead catfish skull that I painted last summer. I carried the skull with me to St Louis, and painted it one afternoon while visiting with my parents there. I still remember how engrossed I became with all the textures on the skull surface, and all the experiments I conducted, trying to replicate them. It was exciting entering the gallery today, and seeing stacks of my paintings waiting to be framed for next month’s show. This particular painting I have not seen in several months. In fact, I had actually forgotten about the work!